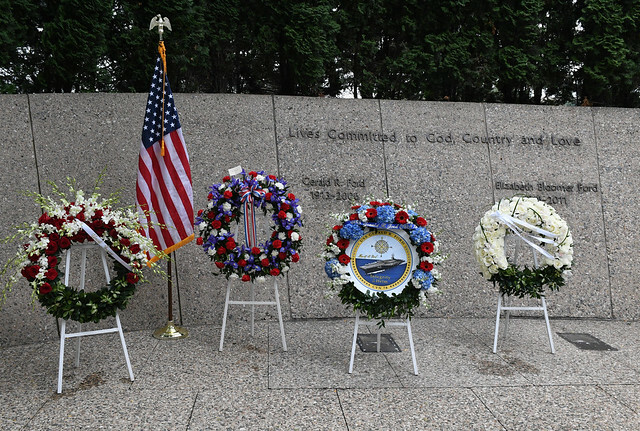 On July 14, 2018, the annual Wreath Laying Ceremony was held at the Tomb of President Gerald R. Ford, marking the 105th anniversary of his birth. Michigan National Guard Major General Gregory J. Vadnais provided the keynote address. Major General Vadnais was joined by Foundation Trustees, staff of the Foundation and Museum, as well as friends from throughout Western Michigan. A wreath was presented from President Donald Trump. In addition, wreaths were presented on behalf of the Crew of USS Gerald R. Ford (CVN 78), Gerald R. Ford Presidential Foundation and Trustees, Children and Grandchildren of President Gerald R. Ford, and Nieces and Nephews of President Gerald R. Ford. The USS Gerald R. Ford Crew Members presented a tree, which was ceremonially planted at the Tomb. The program for the Wreath Laying Ceremony included: Presentation of the Colors by the President Ford Field Service Council, Boy Scouts of America; National Anthem by Grand Rapids Police Department Officer Wally Tett; Pledge of Allegiance by Whitaker Oosterman; Welcome Remarks by Trustee Susan Ford Bales; Invocation by Reverend Stephen Holmgren; the keynote address by Major General Gregory J. Vadnais; and Benediction by Foundation Chairman Mike Ford. Following the ceremony, a statue of Mrs. Betty Ford was unveiled at the Gerald R. Ford Presidential Museum. The statue is now permanently located at the front entrance of the Museum.